Markeus, 40, has been experiencing homelessness on and off for the last dozen years. He said financial problems and mental illness have made stability seemingly unattainable. Over the years he has stayed in the shelter at Catholic Charities’ Dorothy Day Center and in a room at Mary Hall. He was thankful for the room at Mary Hall, thankful for his own space, but Higher Ground Saint Paul seems to have given him a permagrin. 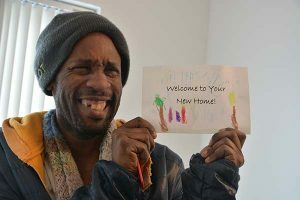 A brand new building—even one he is overjoyed to call home—is a big change. ‘Brand new’ isn’t something Markeus is accustomed to, not a luxury he’s often afforded. He knows shelter mats, old beds and radiators that hiss through the night. For Markeus, it’s more than a new building, it’s a new opportunity. Markeus couldn’t sleep the night before he moved in. Even good change is nervewracking when battling mental illness. He was nervous about the change and worried about the move and thinking about how he never wants to live on the streets again.